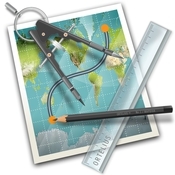 Ortelius is a full-featured vector drawing application especially for map design. Draw directly with features such as roads, rivers, coastlines, buildings, symbols and contours. Ortelius is known for its unique “connectable tracks” and expert stacked styles that make drawing tedious map features easy. Every object supports attribute data that can be referenced by text labels, and everything can be directly drawn and positioned simply by dragging and dropping. Though Ortelius is emphatically not a GIS, it does have limited support for importing shapefiles (refer to documentation for best results; re-projection is not supported). Powerful and extensive text features give you a fine degree of control over labelling. Create your own styles and symbols or use any of the many hundreds built-in. Layers and layer groups keep your work organized.